Homocysteine is an indirect metabolite of methionine metabolism, as well as of creatinine, and it plays an important role in many biochemical processes. Physical effort modifies homocysteine concentration in the blood, as well as the substances taking part in its metabolism. The aim of the study was to assess the influence of intensive efforts of diverse energy changes on the concentrations of homocysteine and the vitamins involved in its metabolism – vit. B6, vit. B12 and folic acid. In the study athletes performed Wingate and progressive test. Before and after tests homocysteine, vitamins B6, B12 and folic acid and creatinine were assayed. Concentration of homocysteine, vit. B12 and creatinine in the blood increased after both tests. Concentration of vit. B6 decreased and folic acid increased after Wingate test while they did not change after a progressive test. Homocysteine concentration negatively correlated with folic acid but positively with creatinine concentration in the blood, as well as with LBM. Regardless of its duration and energetic changes, intensive effort leads to an increase in homocysteine concentration. Correlation of homocysteine with creatinine and the LBM suggest that people with bigger muscle mass can have higher homocysteine concentration in the blood. 1. Austin A.W., Patterson S.M., von Känel R. Hemoconcentration and hemostasis during acute stress: interacting and independent effects. Ann. Behav. Med. 2011; 42: 153–173. 2. Bakońska-Pacoń E. Creatinine clearance and 24-hour creatinine excretion profile in the urine of people after physical exercises. Biol. Sport. 2006; 23: 157–170. 3. Battezzati A., Bertoli S., San Romerio A., Testolin G. Body composition: An important determinant of homocysteine and methionine concentrations in healthy individuals. Nutr. Metabol. Cardiovas. Dis. 2007; 17: 525–534. 4. Boushey C.J., Beresford S.A., Omenn G.S., Motulsky A.G. A quantitative assessment of plasma homocysteine as a risk factor for vascular disease. Probable benefits of increasing folic acid intakes. JAMA. 1995; 274: 1049–1057. 5. Brattstrom L., Lindgren A., Israelsson B., Malinow M.R., Norrving B., Upson B., Hamfelt A. Hyperhomocysteinaemia in stroke: prevalence, cause, and relationships to type of stroke and stroke risk factors. Eur. J. Clin. Invest. 1992; 22: 214–221. 6. Brosnan JT., Da Silva R.P., Brosnan M. The metabolic burden of creatine synthesis. Amino Acids. 2011; 40: 1325–1331. 7. Brouwer I.A., Van Dusseldorp M., Thomas C.M., Duran M., Hautvast J.G., Eskes T.K., Steegers-Theunissen R.P. Low-dose folic acid supplementation decreases plasma homocysteine concentrations: a randomized trial. Am.J. Clin. Nutr. 1999; 69: 99–104. 8. Choi E.Y., Cho Y.O. Vitamin B6 deficiency can reduce fuel storage and utilization in physically trained rats. In. J. Vitam. Nutr. Res. 2008; 78: 64–69. 10. Czajkowska A., Lutosławska G., Mazurek K., Ambroszkiewicz J., Żmijewski P. Correlation between physical activity and plasma homocysteine concentration in young men. Pediatr. Endocrinol. Diab. Metab. 2008; 14: 177–180. 11. Dankner R., Chetrit A., Lubin F., Sela B.A. Life-style habits and homocysteine levels in an elderly population. Aging Clin. Exp. Res. 2004; 16: 437–442. 12. De Bree A., Verschuren V.M., Blom H.J., Kromhout D. Lifestyle factors and plasma homocysteine concentrations in a general population sample. Am. J. Epidemiol. 2001; 154: 150–154. 13. De Cree C., Malinow M.R., Van Kranenburg G.P., Geurten P.G., Longford N.T., Keizer H.A. Influence of exercise and menstrual cycle phase on plasma homocysteine levels in young women – a prospective study. Scand. J. Med. Sci. Sports. 1999; 9: 272–278. 14. Ebenbichler C.F., Bodner K.J., Gander R., Lechleitner M., Herold M., Patsch J.R. Hyperhomocysteinemia in bodybuilders taking anabolic steroids. Eur. J. Int. Med. 2001; 12: 43–47. 16. Friedman A.N., Bostom A.G., Selhub J., Levey A.S., Rosenberg I.H. The kidney and homocysteine metabolism. J. Am. Soc. Nephrol. 2001; 12: 2181–2189. 17. Gaume V., Mougin F., Figard H., Simon-Rigaud M.L., N’Guyen U.N., Callier J., Kantelip J.P., Berthelot A. Physical training decreases total plasma homocysteine and cysteine in middle-aged subjects. Ann. Nutr. Metab. 2005; 49: 125–131. 18. Gelecek N., Teoman N., Ozdirenc M., Pinar L., Akan P., Bediz C., Kozan O. Influences of acute and chronic aerobic exercise on the plasma homocysteine level. Ann. Nutr. Metab. 2007; 51: 53–58. 19. Herrmann M., Schorr H., Obeid R., Scharhag J., Urhausen A., Kindermann W., Herrmann W. Homocysteine increases during endurance exercise. Clin. Chem. Lab. Med. 2003; 41: 1518–1524. 21. Howlett R.A., Parolin M.L., Dyck D.J., Hultman E., Jones N.L., Heigenhauser G.J.F. Spriet L.L. Regulation of skeletal muscle glycogen phosphorylase and PDH at varying exercise power output. Am. J. Physiol. 1998; 275: R418–R425. 22. 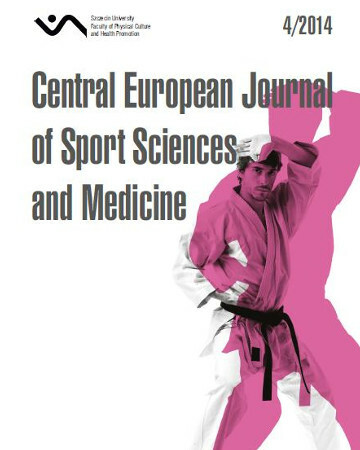 Hübner-Woźniak E., Ochocki P. Effects of training on resting plasma levels of homocysteine and C-reactive protein in competitive male and female wrestlers. Biomed. Hum. Kinet. 2009; 1: 42–46. 23. Humphrey L.L., Fu R., Rogers K., Freeman M., Helfand M. Homocysteine level and coronary heart disease incidence: a systematic review and meta-analysis. Mayo Clin. Proc. 2008; 83: 1203–1212. 24. Joubert L.M., Manore J., Manore M.M. Exercise nutrition and homocysteine. Int. J. Sport. Nutr. Exer. Metab. 2006; 16: 341–361. 26. Lovell D.I., Bousson M., McLellan C. The use of performance tests for the physiological monitoring of training in combat sports: A case study of a world ranked mixed martial arts fighter. J. Athl. Enhance. 2013; 2: 1–6. 27. Murawska-Ciałowicz E. Influence of health training on chosen adipose tissue hormones and homocysteine level in women with different body mass. Studies and Monographs 104. Wroclaw Academy of Physical Education Press. Wroclaw 2012. 28. Murawska-Ciałowicz E., Januszewska L., Zuwała-Jagiełło J., Milczarska J., Zawadzki M., Paprocka-Borowicz M., Wierzbicka- -Damska I. Melatonin decreases homocysteine level in blood of rats. J. Physiol. Pharmacol. 2008; 59: 717–729. 29. Murawska-Ciałowicz E., Wierzbicka-Damska I, Zawadzki M., Januszewska L., Jastrzębska A., Ochmann B., Paprocka-Borowicz M. Correlation of oxidative stress with physical performance in young cyclists. Pol. J. Environ. Stud. 2006; 15: 276–280. 30. Nygard O., Vollset S.E., Refsum H., Stensvold I., Tverdal A., Nordrehaug J.E., Ueland M., Kvale G. Total plasma homocysteine and cardiovascular risk profile. The Hordaland Homocysteine Study. JAMA. 1995; 274: 1526–1533. 31. Okada M., Goda H., Kondo Y., Murakami Y., Shibuya M. Effect of exercise on the metabolism of vitamin B6 and some PLP-dependent enzymes in young rats fed a restricted vitamin B6 diet. J. Nurt. Sci. Vitaminol. (Tokyo) 2001; 47: 116–121. 32. Parolin M.L., Chesley A., Matsos M.P., Spriet L.L., Jones N.L., Heigenhauser G.J.F. Regulation of skeletal muscle glycogen phosphorylase and PDH during maximal intermittent exercise. Am. J. Physiol. 1999; 277: E890–E900. 33. Patel D.R., Torres A.D., Greydanus D.E. Kidney and sports. Adolesc. Med. 2005; 16: 111–119. 34. Ravaglia G., Forti P., Maioli F., Servadei L., Martelli M., Arnone G., Talerico T., Zoli M., Mariani E. Plasma homocysteine and inflammation in elderly patients with cardiovascular disease and dementia. Exp. Gerontol. 2004; 39: 443–450. 36. Selhub J. Homocysteine metabolism Annu. Rev. Nutr. 1999; 19: 217–246. 37. Stead L.M., Brosnan J.T., Brosnan M.E., Vance D.E., Jacobs R.L. Is it time to reevaluate methyl balance in humans? Am. J. Clin.Nutr. 2006; 83: 5–10. 38. Steenge G.R., Verhoef P., Greenhaff P.L. The effect of creatine and resistance training on plasma homocysteine concentration in healthy volunteers Arch. Intern. Med. 2001; 161: 1455–1457. 39. Tessari P., Coracina A., Kiwanuka E., Vedovato M., Vettore M., Valerio A., Zaramella M., Garibotto G. Efects of insulin on methionine and homocysteine kinetics in type 2 diabetes with nephropathy. Diabetes 2005; 54: 2968–2976. 40. Whrite M., Francis K., Cornwell P. Effect of acute exercise on plasma homocysteine. J. Sports Med. Phys. Fitness 1998; 38: 262–265. 41. Wollesen F., Brattström L., Refsum H., Ueland P.M., Berglund L., Berne C. Plasma total homocysteine and cysteine in relation to glomerular filtration rate in diabetes mellitus Kidney Int. 1999; 55: 1028–1035.